Treasured Secrets by Kendall Talbot narrates the adventurous love story of Rosalina and Archer. Rosalina and Archer have been together for three years and completely in love but despite their love for each other, there are secrets between them. Secrets like why Archer has the same nightmare each night which always leaves him sweaty and screaming, why he doesn't want to share his frightening dream and his past with Rosalina and why he is lying to her! Their life takes a turn when Archer asks her to leave when Rosalina asks him about his dream. Heartbroken, she returns to Italy but is unable to forget him. Months later while visiting a church, Rosalina spots an old painting showing the same locket that Archer wears and is so mysterious about. What is it? It is with this unexpected visit to the church that life changes for Rosalina and in turn, for Archer. Thrown in a 700 year old mystery, their love is tested. Will they come together again or is their love a thing of the past? I picked up, Treasured Secrets by Kendall Talbot because of the blurb which intrigued me with a mystery, suspense, adventure and finally, a romance. With all my favourite ingredients, the cover showing a quaint setting with promise of exotic locales had me picking up this book to read. While I had hoped a "glued-to-my-seat" story, I was somewhat disappointed with the book. Firstly, I could not understand why Archer was so adamant to keep the secret and thought that it would be something big but when the secret was unveiled, well, I didn't find anything worth breaking your love over. Secondly, the love triangle among Archer, Rosalina and her friend in Italy is weak and for sometime I kept hoping for fireworks here with two men fighting for their love but this didn't happen. The professor kept professing his love for Rosalina but then easily let her go like all his previous proclamations of love were nothing! Thirdly, Rosalina is shown to be living with her Nana in Italy but when Archer arrives, not even once is there a confrontation between him and Nana. How is it possible for two people living in the same house to never meet? I kept hoping to see Nana's reaction to Archer's return but the meeting never happened. Fourthly, the villain is hinted at having a disease and his motivation behind the treasure is also related to this disease but then nothing concrete is shown to us about his history, what ails him and the treasure is nothing related to this! It all got very confusing. However, despite the above points, I did enjoy visualizing the luxury yacht, the exotic locales of Italy and the Greek Islands and the underwater beauty with crisp clarity of the water and abundant and varied fishes and sea plants. The best part of the story is Archer's past which held me captive and his eventual revisit to his past had me misty eyed and hoping for peace and happiness for him. The thrill of the chase to find the treasure and saving themselves from the cruel and cunning villain had me sitting up and swiftly turning the pages. The author's writing style is simple and engaging but the plot while promising wasn't executed to its full potential. I was not satisfied with the points I highlighted above and so I think the plot could have been handled better. The romance part is great and I loved the emotions that the author is able to elicit from the readers but the mystery and suspense part needed work. All in all, an entertaining story which took me places. 3.5 out of 5 to Treasured Secrets. I received the book from the author and the tour organizers, CBB promotions and I am very thankful to them. The above review is my honest and unbiased opinion and in no way influenced. 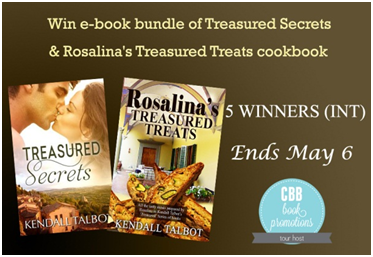 The author will be giving away ebook bundle of Treasured Secrets & Rosalina’s Treasured Treats cookbook to 5 winners of the below Rafflecopter. 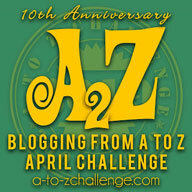 Giveaway ends on May 6 and open internationally.